Happy Friday! The Earth moves at 19 miles per second. Assuming you just took three seconds to read this, you are now 57 miles away from where you were when you started. When the Lakers were officially eliminated from the playoffs weeks ago, it brought to the forefront the idea that, while LeBron James is still the face of the NBA, that won't be the case forever. 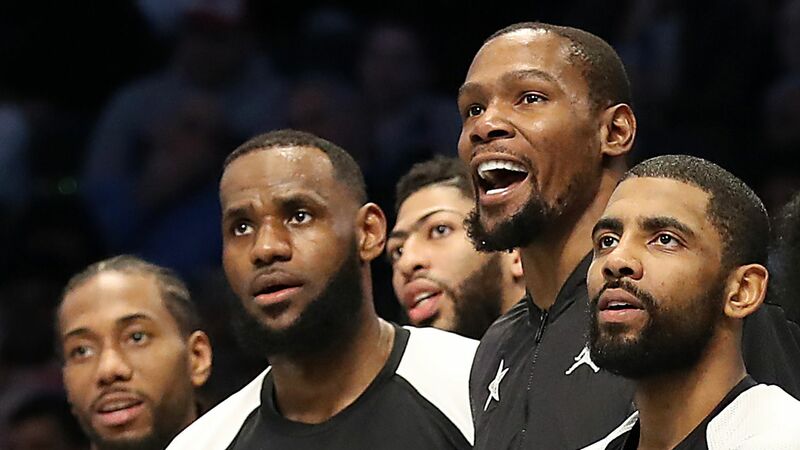 Why it matters: LeBron's absence is one of many "changing of the guard" storylines heading into the 2018-19 NBA playoffs, making the next two months both exciting and consequential. The next face: During All-Star weekend, LeBron told Giannis Antetokounmpo, "I love everything about you, man." Most players and fans would agree with that sentiment. After all, this is an MVP frontrunner who is — gasp! — humble. If he can lead the Bucks to the finals, no one will have a stronger claim to the "future face of the league" crown. The end of the Dubs' dynasty? With Kevin Durant expected to leave in free agency, this could be the last hurrah for one of the most talented rosters ever assembled. But what if they three-peat? No star player has ever left immediately after winning a ring, let alone three. The rise of a new dynasty? I'm not sure I've ever seen a second-place team get less love than the Nuggets. Yes, I understand that they're probably still a year or two away, but they deserve to be taken more seriously. Same goes for Philly and Boston, who are being labeled "threats" when they should really be labeled "contenders." A precursor to free agency: It's no secret that the Celtics want to recruit Anthony Davis to play with Kyrie Irving. It's also no secret that Kyrie could leave for the Knicks. How Boston performs in the playoffs could dictate the futures of two iconic franchises. Same goes for Toronto, who would love nothing more than to go on a run that convinces Kawhi Leonard to stay. The bottom line: This summer will mark the end of one era and the beginning of another — and the playoff performances of a handful of teams will dictate just how far that pendulum swings. There are endless storylines surrounding every NHL playoff series, but instead of listing off each one, let's put a few bigger picture ones on your radar. 1. Best team ever? The numbers place the Tampa Bay Lightning in the conversation for best regular-season team ever. They won 62 games for crying out loud, which is something only one other team has ever done (1995-96 Detroit Red Wings). Yes, but: The Lightning's spectacular season won't mean nearly as much without a championship, and history suggests that regular-season dominance doesn't exactly equate to postseason success. By the numbers: Of the 13 teams that have finished with the NHL's best record since the lockout of 2004-05, only two — the 2007-08 Red Wings and the 2012-13 Chicago Blackhawks — have gone on to lift the Stanley Cup. 2. Canada's Big 3: The Stanley Cup, which originated in Canada, hasn't been won by a team from the Great White North since Montreal took it home in 1993. That's 26 years ago! The good news: There are three hopefuls in this year's field — the Toronto Maple Leafs, Calgary Flames and Winnipeg Jets — and Calgary has the second-best odds of capturing the title, per The Action Network. 3. Hero/villain: In his first full season as owner, Tom Dundon helped the Carolina Hurricanes make the playoffs for the first time since 2009. So, in Raleigh, he's somewhat of a hero. The other side: Earlier this month, Dundon pulled the plug on the Alliance of American Football's inaugural season less than seven weeks after investing $250 million to rescue the league. So, everywhere else in America, he's somewhat of a villain. The average Major League Baseball team is worth $1.78 billion, according to Forbes, an 8% increase from last year. Additionally, all 30 franchises are worth at least $1 billion; whereas just 10 years ago, only two were (Mets and Yankees). P.S. ... In other baseball news, Ozzie Albies' new deal with the Braves might be the worst contract ever signed. Not hyperbole. "Bryson DeChambeau, with a physics degree from Southern Methodist University, fired an opening-round 66, with nine birdies and three bogeys." "Brooks Koepka, who is known to spend as much time in the gym as on the practice green, posted the same 6-under score with a flawless bogey-free round." Big names: Tiger Woods, Rickie Fowler, Francesco Molinari and Jason Day are tied for 11th at 2-under … Bubba Watson is tied for 29th at even par ... Rory McIlroy, Patrick Reed and Justin Thomas are tied for 44th at 1-over … Justin Rose and Jordan Spieth is tied for 63rd at 3-over. Best story: Canada's Corey Conners (-2) was the final player invited to the Masters after winning last week's Valero Texas Open. He flew in on Sunday night, took Monday off and then practiced Tuesday before shopping for clothes. 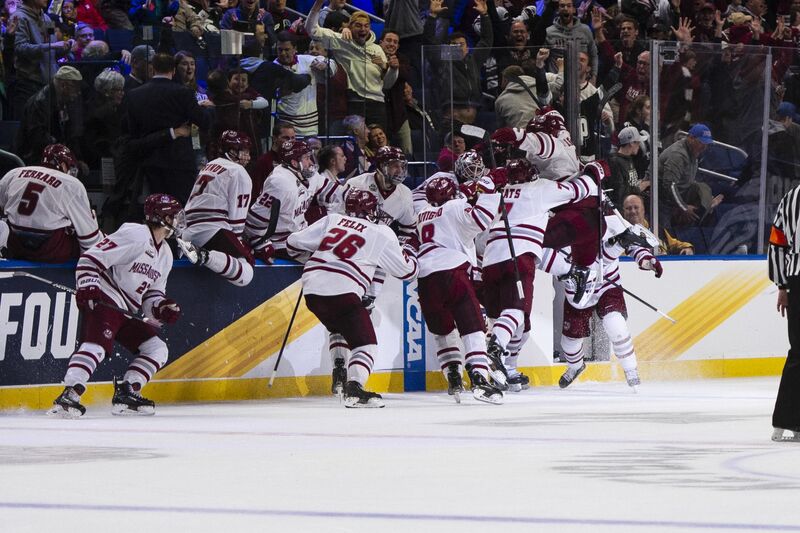 Massachusetts 4, Denver 3 (OT): Freshman Marc del Gaizo scored on a slapshot from the top of the circle with 4:42 left in overtime to send UMass to its first-ever national championship. The intrigue: Defenseman Cale Makar is the favorite to win the Hobey Baker Award (college hockey's Heisman) and widely considered to be the NHL's No. 1 prospect after being picked fourth by Colorado last year. Next week, there's a chance he joins them in their playoff series ... against his hometown Calgary Flames. What a ride this kid's on right now. Go deeper: When coach Greg Carvel arrived at UMass in 2016, he inherited a program that had just two winning seasons since 1995. This year, they were No. 1 in the nation for much of the season — and now this. Unreal turnaround. Minnesota Duluth 4, Providence 1: Justin Richards scored twice for the defending champion Bulldogs in a game that was much closer than the score would indicate (two empty-net goals). 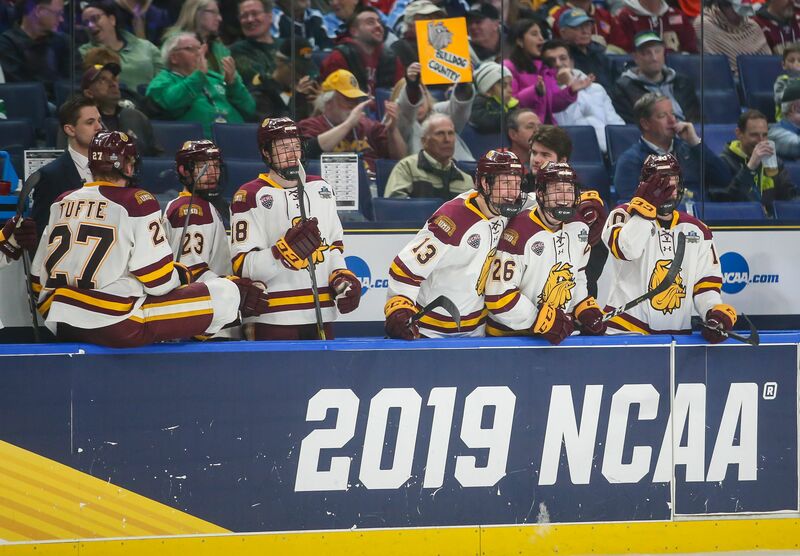 History is made: With the win, Minnesota Duluth becomes the first team to reach three consecutive championship games since Boston College (2006-08). And if they win tomorrow night, they'll be the first back-to-back champs since Denver in 2004-05. What's next: The championship game is Saturday at 8 pm ET (ESPN2). 39 years ago today, the United States Olympic Committee voted to support President Jimmy Carter's call to boycott the 1980 Summer Olympics in Moscow following a Soviet invasion of Afghanistan. In a letter to the USOC, Carter contended that the boycott was necessary to "make clear to the Soviet Union that it cannot trample upon an independent nation and at the same time do business as usual with the rest of the world." 64 other countries followed America's lead, resulting in only 80 nations participating in the Olympics — the smallest turnout since 1956. The big picture: In response to the boycott, the Soviet Union counter-boycotted the 1984 Summer Olympics in Los Angeles before eventually returning to Olympic competition in 1988. Soviet troops remained in Afghanistan until 1989, with some estimates putting the number of deaths in that conflict at nearly two million people. Four of the eight remaining Champions League teams have at least three Champions League titles. Barcelona and Liverpool have five, Ajax has four and Manchester United has three. Question: Who are the only other four clubs with at least three Champions League titles? Hint: Three won this decade, while the fourth last won in 2007. "Reaction to the course from the runners I spoke to was overwhelmingly positive, if respectful. They described the course as 'killer,' a 'beast,' and, after a bit of recovery, 'fun.' One told me it was the hardest thing she'd endured short of childbirth. This, from people for whom ten miles easy is a thing." Today's contest will be held within The Action Network app. Yesterday's results: 31.6% correctly predicted that Jordan Spieth would shoot over 71.5. He shot 75 … 54.6% correctly predicted that Bryson DeChambeau would record more birdies than Jason Day. Bryson had 9, while Day had 4 … 9.6% correctly predicted that Phil Mickelson would finish with the best round in his group. Trivia answer: Real Madrid (13 titles) won last year, Bayern Munich (5) won in 2013, Inter Milan (3) won in 2010 and AC Milan (7) last won in 2007.